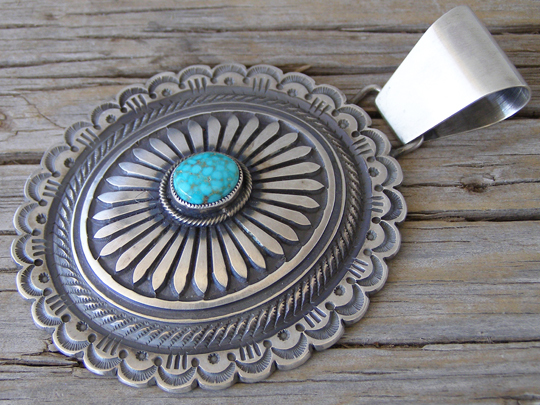 Here we have a classic Navajo hammered ingot concha pendant. This is set with a perfect oval of natural, untreated Turquoise Mountain turquoise in a handmade serrated bezel. Stylized eagle feathers radiate from the stone and a scalloped edge with impeccably classic stampwork marks the border of this concha. The bale on this will accommodate Erma Arviso's antiqued Sterling beads up to 8 mm. diameter. Dimensions of pendant (excluding bale): 2 3/8" x 1 1/8"